Gaon of Pumbedita; born in 939; died March 28, 1038. He received his Talmudic education from his father, Sherira, and in early life acted as his assistant in teaching (Schechter, "Saadyana," p. 118). In his forty-fourth year he became associated with his father as "ab bet din," and with him delivered many joint decisions. As a consequence of the calumnies of their antagonists they were imprisoned together, and their property was confiscated, by the calif Al-Ḳadir (997; see Abraham ibn Daud in "M. J. C." i. 67). The imprisonment, however, seems not to have lasted very long. Sherira, then old and sick, appointed his son to the position of gaon (998). Hai's installation was greeted with great enthusiasm by the Jewish population. An old tradition (Abudarham, ed. Venice, p. 70c) says that on the Sabbath after Sherira's death, at the end of the reading of the weekly lesson, the passage (Num. xxvii. 16 et seq.) in which Moses asks for an able follower was read in honor of Hai. Thereupon, as hafṭarah, the story of Solomon's accession to the throne was read (I 'Kings ii. 1-12), the last verse being modified as follows: "And Hai sat on the throne of Sherira his father, and his government was firmly established." Hai remained gaon until his death in 1038 (according to Abraham ibn Daud, l.c. p. 66). He was celebrated by the Spanish poet Solomon ibn Gabirol and by Samuel ha-Nagid (see "Ha-Karmel," 1875, p. 614). Hai ben Sherira's chief claim to recognition rests on his numerous responsa, in which he gives decisions affecting the social and religious life of the Diaspora. Questions reached him from Germany, France, Spain, Turkey, North Africa, India, and Ethiopia (see Müller, "Mafteaḥ," pp. 197-201 et seq. ; Harkavy, "Studien und Mittheilungen," iv. 225). His responsa, more than eight hundred in number, deal with the civil law, especially the laws concerning women, with ritual, holidays, etc. Many of them contain explanations of certain halakot, haggadot, and Talmudic matters. In halakic decisions he quotes the Jerusalem Talmud, but without ascribing any authority to it ("Teshubot ha-Ge'onim," ed. Lyck, No. 46). 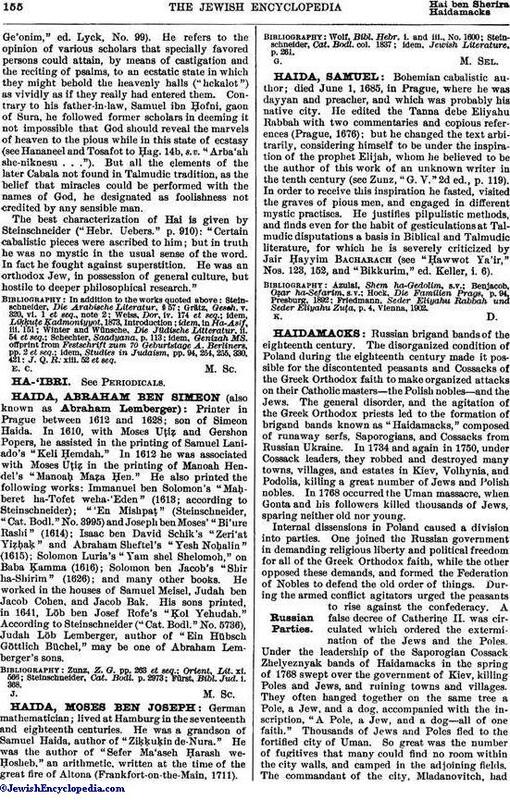 Many of his responsa may have been written in Arabic; only a few of them have been preserved ("Sha'are Ẓedeḳ," Salonica, 1792; Harkavy, "Teshubot ha-Ge'onim," Nos. 83-117, 197, 198, 201, 203, 325, 410, 421; Derenbourg, in "R. E. J." xxii. 202; Steinschneider, "Hebr. Uebers." p. 909; idem, "Die Arabische Literatur der Juden," p. 101; Müller, l.c.). Hai ben Sherira codified various branches of Talmudic law. He wrote in Arabic a treatise on purchases, translated into Hebrew by Isaac Albargeloni with the title "Ha-Meḳaḥ weha-Mimkar" (1078); "Sefer ha-Mashkon," a treatise on mortgage, anonymously translated into Hebrew; "Mishpeṭe ha-Tanna'im," a treatise on conditions, also anonymously translated into Hebrew. These three treatises were published together (Venice, 1604); later editions also contain commentaries by Eleazar ben Aryeh (Vienna, 1800) and by Hananiah Isaac Michael Aryeh (Salonica, 1814). Another anonymous translation of them exists in manuscript under the title "Dine Mamonot." According to Azulai, Hai also wrote in Arabic "Sha'are Shebu'ot," a treatise on oaths. According to another Hebrew source, the original title was "Kitab al-Aiman." This treatise was twice anonymously translated into Hebrew: (1) "Mishpeṭe Shebu'ot" (Venice, 1602; Altona, 1782); (2) "Sefer Meḥubbar be-Ḳoẓer Min ha-Dinim be-Bi'ur Kelalim we-'lḳḳarim be-Ḥelḳe Ḥiyyub la-Shebu'ah" (Neubauer, "Cat. Bodl. Hebr. MSS." No. 813). The "Sha'are Shebu'ot" were metrically arranged by an anonymous writer, probably of the thirteenth century, under the title "Sha'are Dine Mamonot we-Sha'are Shebu'ot," and by Levi ben Jacob Alkalai. Hai's treatise on boundary litigations, "Meẓranut," is known only through quotations (Rapoport, in "Bikkure ha-'Ittim," x. 93, note 27). "Hilkot Tefillin," "Siddur Tefillah," and "Metibot" are also quoted as his (Rapoport, l.c. xi. 91). 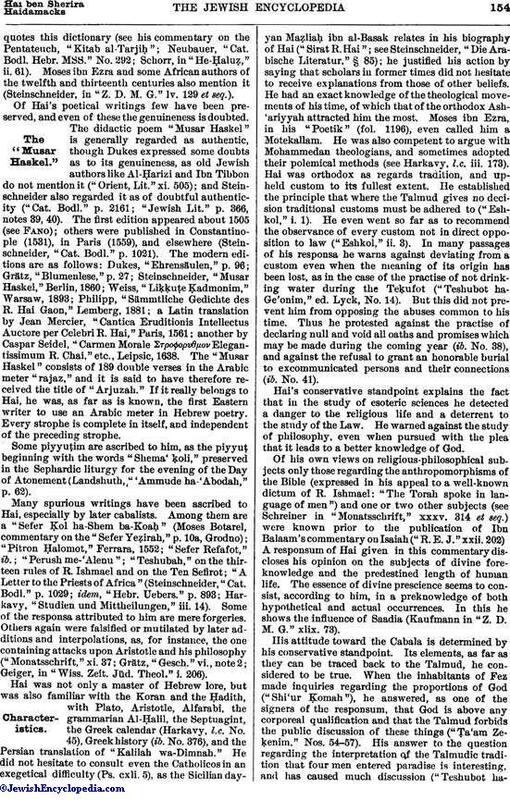 Hai b. Sherira's philological abilities were directed to the expounding of the Mishnah; of this work only the portion on Seder Ṭohorot is extant; it was published by T. Rosenberg in "Ḳobeẓ Ma'aseh" (Berlin, 1856). This commentary contains especially interesting linguistic notes, Arabic and Aramaic being often adduced for comparison. The author quotes the Mishnah, the two Talmuds, the Tosefta, the Sifra, Targums Onḳelos and Jonathan, the Septuagint, the works of Saadia, the "Sifre Refu'ah," and other anonymous sources. He also quotes his own commentary on Zera'im. (p. 34) and on Baba Batra (p. 43). These quotations, and many others cited by the 'Aruk, prove that the commentary extended to the whole Mishnah, containing among other explanations historical and archeological notes. Some passages of the commentary are quoted by Alfasi and Hananeel on Yoma, and by Solomon ibn Adret in his "Ḥiddushim" (Weiss, "Dor," iv. 185 et seq. ), while Abu al-Walid ibn Janaḥ cites Hai's commentary to Sabbath frequently (Bacher, "Leben und Werke des Abulwalid," p. 87). It is uncertain whether Hai wrote commentaries in Arabic on the Bible as a whole or on parts of it. Ibn Ezra, however, in his commentary on Job quotes several of his explanations. Hai compiled also a dictionary of especially difficult words in the Bible, Targum, and Talmud, the Arabic title of which was "Al-Ḥawi." Abraham ibn Ezra translated this title, in his "Moznayim," into "Ha-Me'assef," while Abu Bukrat's translation, "Ha-Kolel," and Moses Botarel's translation, "Ha-Ḳemiẓah," did not become popular. Fragments of this dictionary were discovered by Harkavy, and published by him in "Miẓpah" (St. Petersburg, 1886), in "Ḥadashim Gam Yeshanim" (No. 7), and in "Mi-Mizraḥ umi-Ma'arab" (1896, iii. 94 et seq. ); these show that the work was arranged according to an alphabetic-phonetic plan of three consonants in every group; for instance, s.v. it quotes the permutations . 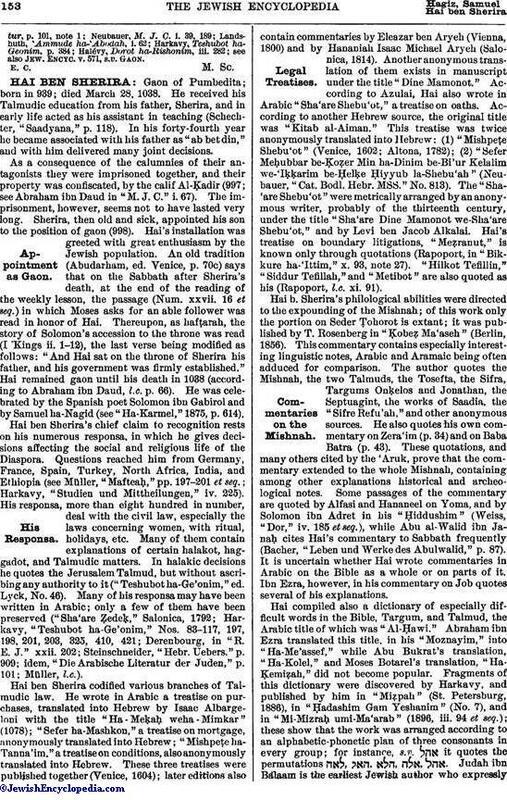 Judah ibn Balaam is the earliest Jewish author who expresslyquotes this dictionary (see his commentary on the Pentateuch, "Kitab al-Tarjiḥ"; Neubauer, "Cat. Bodl. Hebr. MSS." No. 292; Schorr, in "He-Ḥaluẓ," ii. 61). Moses ibn Ezra and some African authors of the twelfth and thirteenth centuries also mention it (Steinschneider, in "Z. D. M. G." lv. 129 et seq.). Of Hai's poetical writings few have been preserved, and even of these the genuineness is doubted. The didactic poem "Musar Haskel" is generally regarded as authentic, though Dukes expressed some doubts as to its genuineness, as old Jewish authors like Al-Ḥarizi and Ibn Tibbon do not mention it ("Orient, Lit." xi. 505); and Steinschneider also regarded it as of doubtful authenticity ("Cat. Bodl." p. 2161; "Jewish Lit." p. 366, notes 39, 40). The first edition appeared about 1505 (see Fano); others were published in Constantinople (1531), in Paris (1559), and elsewhere (Steinschneider, "Cat. Bodl." p. 1021). The modern editions are as follows: Dukes, "Ehrensäulen," p. 96; Grätz, "Blumenlese," p. 27; Steinschneider, "Musar Haskel," Berlin, 1860; Weiss, "Liḳḳuṭe Ḳadmonim," Warsaw, 1893; Philipp, "Sämmtliche Gedichte des R. Hai Gaon," Lemberg, 1881; a Latin translation by Jean Mercier, "Cantica Eruditionis Intellectus Auctore per Celebri R. Hai," Paris, 1561; another by Caspar Seidel, "Carmen Morale ΣτροφορυΘμον Elegantissimum R. Chai," etc., Leipsic, 1638. The "Musar Haskel" consists of 189 double verses in the Arabic meter "rajaz," and it is said to have therefore received the title of "Arjuzah." If it really belongs to Hai, he was, as far as is known, the first Eastern writer to use an Arabic meter in Hebrew poetry. Every strophe is complete in itself, and independent of the preceding strophe. Some piyyuṭim are ascribed to him, as the piyyuṭ beginning with the words "Shema' ḳoli," preserved in the Sephardic liturgy for the evening of the Day of Atonement (Landshuth, "'Ammude ha'Abodah," p. 62). Many spurious writings have been ascribed to Hai, especially by later cabalists. Among them are a "Sefer Ḳol ha-Shem ba-Koaḥ" (Moses Botarel, commentary on the "Sefer Yeẓirah," p. 10a, Grodno); "Pitron Ḥalomot," Ferrara, 1552; "Sefer Refafot," ib. ; "Perush me-'Alenu"; "Teshubah," on the thirteen rules of R. Ishmael and on the Ten Sefirot; "A Letter to the Priests of Africa" (Steinschneider, "Cat. Bodl." p. 1029; idem, "Hebr. Uebers." p. 893; Harkavy, "Studien und Mittheilungen," iii. 14). Some of the responsa attributed to him are mere forgeries. Others again were falsified or mutilated by later additions and interpolations, as, for instance, the one containing attacks upon Aristotle and his philosophy ("Monatsschrift," xi. 37; Grätz, "Gesch." vi., note 2; Geiger, in "Wiss. Zeit. Jüd. Theol." i. 206). Hai was not only a master of Hebrew lore, but was also familiar with the Koran and the Ḥadith, with Plato, Aristotle, Alfarabi, the grammarian Al-Ḥalil, the Septuagint, the Greek calendar (Harkavy, l.c. No. 45), Greek history (ib. No. 376), and the Persian translation of "Kalilah wa-Dimnah." He did not hesitate to consult even the Catholicos in an exegetical difficulty (Ps. cxli. 5), as the Sicilian dayyan Maẓliaḥ ibn al-Basak relates in his biography of Hai ("Sirat R. Hai"; see Steinschneider, "Die Arabische Literatur," § 85); he justified his action by saying that scholars in former times did not hesitate to receive explanations from those of other beliefs. He had an exact knowledge of the theological movements of his time, of which that of the orthodox Ash'ariyyah attracted him the most. Moses ibn Ezra, in his "Poetik" (fol. 1196), even called him a Motekallam. He was also competent to argue with Mohammedan theologians, and sometimes adopted their polemical methods (see Harkavy, l.c. iii. 173). Hai was orthodox as regards tradition, and upheld custom to its fullest extent. He established the principle that where the Talmud gives no decision traditional customs must be adhered to ("Eshkol," i. 1). He even went so far as to recommend the observance of every custom not in direct opposition to law ("Eshkol," ii. 3). In many passages of his responsa he warns against deviating from a custom even when the meaning of its origin has been lost, as in the case of the practise of not drinking water during the Teḳufot ("Teshubot ha-Ge'onim," ed. Lyck, No. 14). But this did not prevent him from opposing the abuses common to his time. Thus he protested against the practise of declaring null and void all oaths and promises which may be made during the coming year (ib. No. 38), and against the refusal to grant an honorable burial to excommunicated persons and their connections (ib. No. 41). Hai's conservative standpoint explains the fact that in the study of esoteric sciences he detected a danger to the religious life and a deterrent to the study of the Law. He warned against the study of philosophy, even when pursued with the plea that it leads to a better knowledge of God. Of his own views on religious-philosophical subjects only those regarding the anthropomorphisms of the Bible (expressed in his appeal to a well-known dictum of R. Ishmael: "The Torah spoke in language of men") and one or two other subjects (see Schreiner in "Monatsschrift," xxxv. 314 et seq.) were known prior to the publication of Ibn Balaam's commentary on Isaiah ("R. E. J." xxii. 202) A responsum of Hai given in this commentary discloses his opinion on the subjects of divine fore-knowledge and the predestined length of human life. The essence of divine prescience seems to consist, according to him, in a preknowledge of both hypothetical and actual occurrences. In this he shows the influence of Saadia (Kaufmann in "Z. D. M. G." xlix. 73). His attitude toward the Cabala is determined by his conservative standpoint. Its elements, as far as they can be traced back to the Talmud, he considered to be true. When the inhabitants of Fez made inquiries regarding the proportions of God ("Shi'ur Ḳomah"), he answered, as one of the signers of the responsum, that God is above any corporeal qualification and that the Talmud forbids the public discussion of these things ("Ṭa'am Ze-ḳenim," Nos. 54-57). His answer to the question regarding the interpretation of the Talmudic tradition that four men entered paradise is interesting, and has caused much discussion ("Teshubot ha-Ge'onim," ed. Lyck, No. 99). He refers to the opinion of various scholars that specially favored persons could attain, by means of castigation and the reciting of psalms, to an ecstatic state in which they might behold the heavenly halls ("hekalot") as vividly as if they really had entered them. Contrary to his father-in-law, Samuel ibn Ḥofni, gaon of Sura, he followed former scholars in deeming it not impossible that God should reveal the marvels of heaven to the pious while in this state of ecstasy (see Hananeel and Tosafot to Ḥag. 14b, s.v. "Arba'ah she-niknesu . . ."). But all the elements of the later Cabala not found in Talmudic tradition, as the belief that miracles could be performed with the names of God, he designated as foolishness not credited by any sensible man. The best characterization of Hai is given by Steinschneider ("Hebr. Uebers." p. 910): "Certain cabalistic pieces were ascribed to him; but in truth he was no mystic in the usual sense of the word. In fact he fought against superstition. He was an orthodox Jew, in possession of general culture, but hostile to deeper philosophical research." J. Q. R: xiii. 52 et seq.